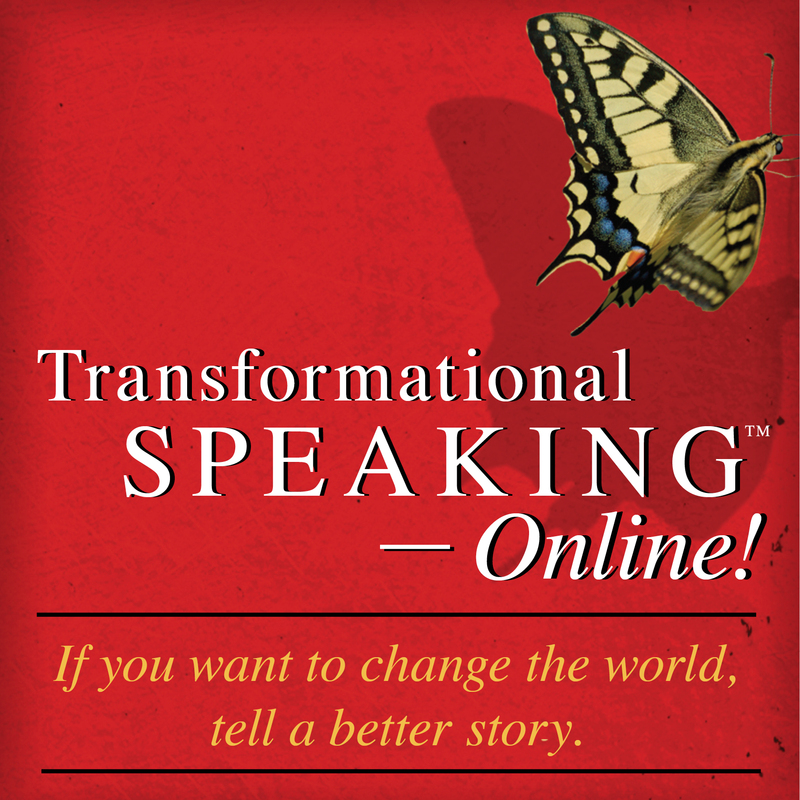 Here’s What You’ll Find in Transformational Speaking™- Online! 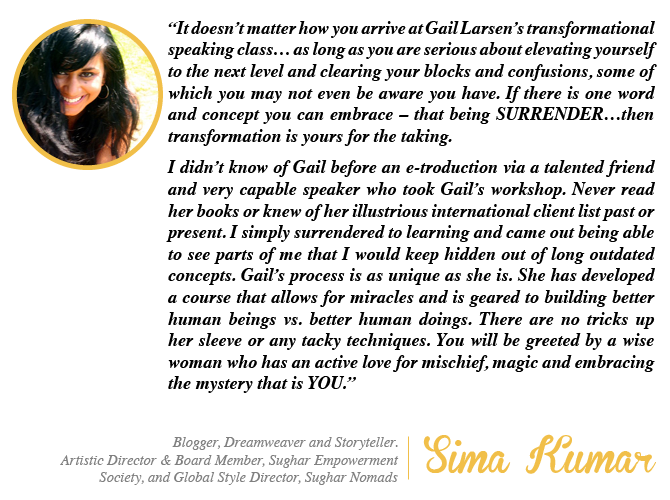 The course includes seven comprehensive modules with a curriculum that follows the design of Gail’s four-day live Immersion experience. Each module begins with a video to help you center and ground yourself and is filled with step-by-step training audios, worksheets, and video conversations with Transformational Speakers to support you in applying what you’re learning. Plus you’ll have regularly scheduled community calls with Gail, where you can ask questions, present your unique challenges, and receive live-group coaching. The calls will be recorded as part of the course, and you may join at any time. Our virtual adventure begins with an in-depth orientation where you’ll see that Transformational Speaking has nothing to do with tired techniques and pedantic formulas that only obscure your natural brilliance. Instead, you’ll begin to recognize that a compelling communicator already lives within you. From there, you can set into motion the world-transforming story that your life, and your life alone, has prepared you to tell. Journey deep within yourself to reveal, unlock, and claim your original gifts—also known as your Original Medicine. 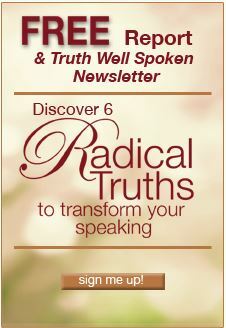 Being clear on your true essence is the first vital step in becoming a transformational speaker. When you learn to stand in the power of your Original Medicine, you trust who you are and move out of comparison and competition. You can choose to speak and to speak up where your authentic gifts can be fully expressed and received. Learn the Four Levels of Engagement and discover why story is the most powerful way to reach your audience on a soul level so that change is possible. You’ll begin to explore the vast endowment of story your life has provided, beginning with the story of where you are right now, and the new story that you hold in your heart. Discover the difference between your comfort zone where facts and information demonstrate your professional competence and your HomeZone, where you create a personal connection through your authenticity, vulnerability, and humanity. Here you step into your full power to captivate and influence your audience with the power of story, moving beyond being not only professional but also to touching people emotionally. Learning to access your HomeZone transforms you from an ordinary and forgettable speaker to a powerful message bearer that opens the door to real change. Once you’ve discovered the flow and natural communications ability available to you in your HomeZone™, your speaking skills are largely in place. To take your speaking to the next level, apply the four vital skills to bring you and your speaking fully alive. Once you become aware of them, you’ll likely find that just one of them is your personal key to transforming your capacity to engage and move an audience. You’ll also discover a voice within you that you have silenced that will expand and enliven your life and your speaking. Dig deep into the rich soil of your own life to mine not only your signature story—the story only you can share—but also to define the one core message that is burning inside you. This message is the one that simplifies and amplifies all your decisions from this day forward! Once you understand the energetics of change, you’ll understand why joy—the 540 Vibe!—is the compass to use in finding the audience ready and willing to act on your call to action. Then you’ll be ready to craft your original world-changing speech and take it to the audience you were born to serve. Discover how to craft a powerful speech—without a script!—with an easy method of presentation development that supports both spontaneity and structure. It’s show time! Define your own “Body Rules” to remain whole in the work of change, as well as your on-site requirements to assure your success and avoid surprises when you take the stage. We’ll wrap up with expert advice on getting yourself out there as a speaker, including written materials to showcase your credentials and what you can do to be ready for representation by a speakers’ bureau or agent. To learn more, listen to a wonderful conversation I had on March 29, 2017, with four students of Transformational Speaking-Online! Rodrigo Allel, Leah Harris, Lori Robinson and Karen Powell joined me from across the world for a teleconference to walk through our Online Academy platform and discuss their experience of this potent online course. In this recording, you can experience their enthusiasm for how the work has touched their lives and enriched their communications and self-trust. Once you hear what they have to say, you’ll want to embark on that journey yourself! 1. An Action Guide and Journal for your assignments. 2. A short video from me (or a trusted resource) sharing a technique for grounding and centering yourself. This is to support you in alleviating fear of speaking as well as showing up as a full-bodied, trustworthy human with something significant to share—not as a talking head delivering facts and information that are easily forgotten. 3. The teaching/coursework for the module, delivered by me on audio. 5. Your assignment for a self-video so you can track your progress as you more fully express and embody your voice. Join us in this Inspiring Adventure filled with Substance and Spirit!